Party planning is nothing new to me. I've been an events planner since the 90s, organizing corporate events, private social functions, and weddings. It's never a walk in the park. They gave me a lot of stress and fulfillment at the same time. 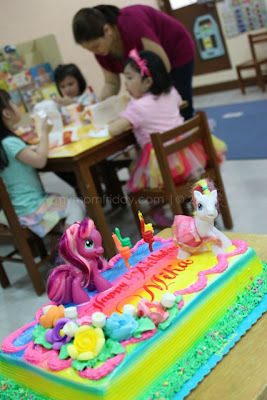 With children's birthday parties, however, there are different dynamics and elements to it. I did not attempt to go into that anymore. 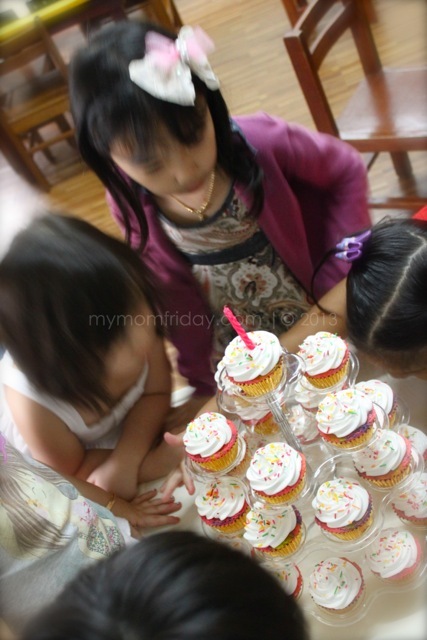 I only planned my own kids' parties, and suggest ideas when friends ask for my help with theirs. 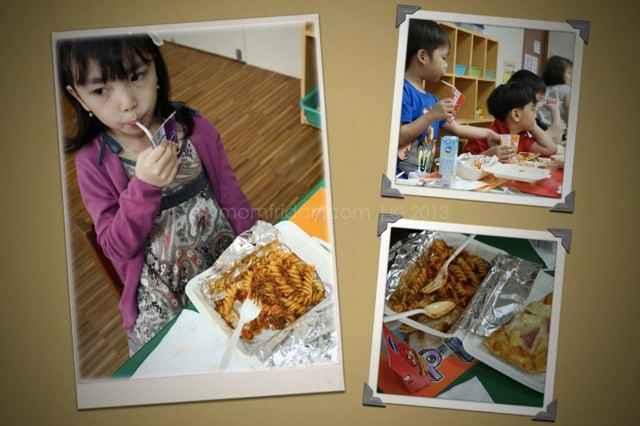 This time, it will be all about birthday parties celebrated in school - particularly for a small class. 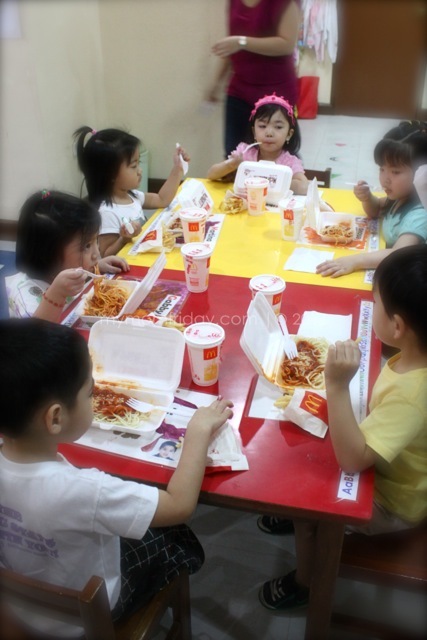 Most big schools do not allow class parties, while pre-schools are more open to parents hosting one, usually during snack time. 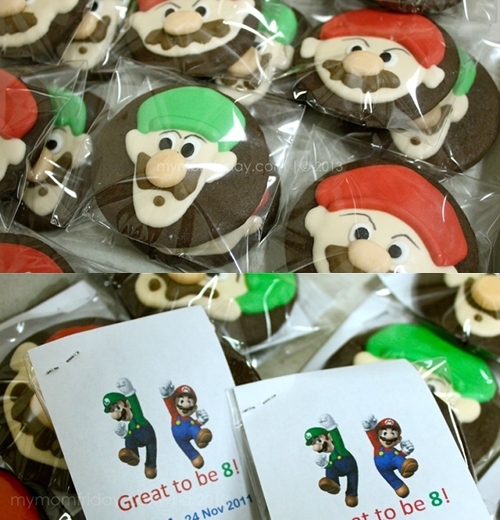 I've been throwing simple class parties for both my children since they began attending pre-school - 5 "parties" for the boy and 4 for the girl (and counting), all because they wanted to celebrate with their classmates (and partly because their friends threw parties and they wanted to host their own as well). As a follow-up to my girl's birthday feature here, I promised to share what I prepared for her very recent celebration with her classmates, plus a few more ideas from parties past. Frankly, I don't find the need to give out invites since the "guests" are the classmates and teachers, all of whom (unless there will be absentees) are already there in class whether you invite or not. 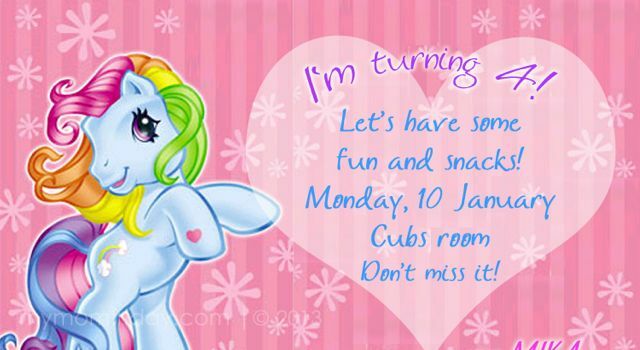 There were two or three parties in the past where I gave out invitations because the kids expected me to make one so they can hand them out to their classmates and announce their upcoming celebration. They feel special that way, you know. =) They still asked for one during their last birthdays, but I insisted there's no need and we'll just tell the teacher about the plan. You can buy ready-made invitation cards or make your own, like what I did here for the girl's 4th birthday. M wanted Rainbow Dash from My Little Ponies as her theme. I just made the layout like a postcard and printed at home. I also printed her classmates' names on plain label stickers and placed it at the back. No need for envelopes. With or without an invitation, it's good to have a theme or color scheme to make all the elements cohesive and unified. 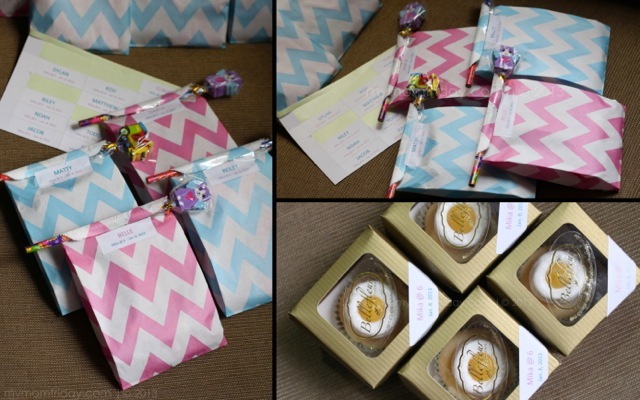 I did observe that most classmates gave gifts when invitations were sent out. =) But it's always best not to expect any. 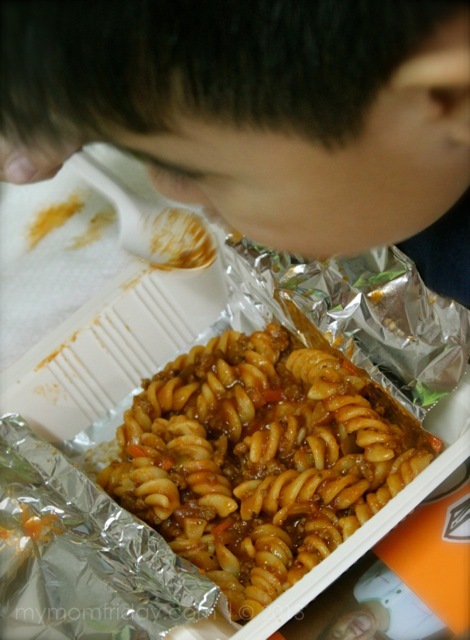 Over the years, I've tried catered food, fast food meals, and home-cooked dishes to serve these finicky little boys and girls. Not everyone will eat everything you will serve. But I learned that the simpler the food, the better. 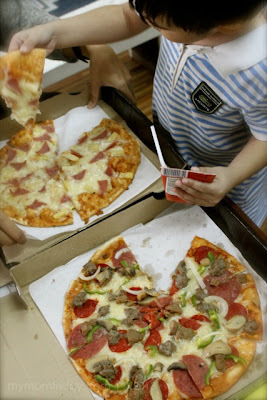 This is the most important part of the party, but no fancy food required to make the kids happy and full. Some were already happy with a slice of pizza, while others wiped out their pasta. 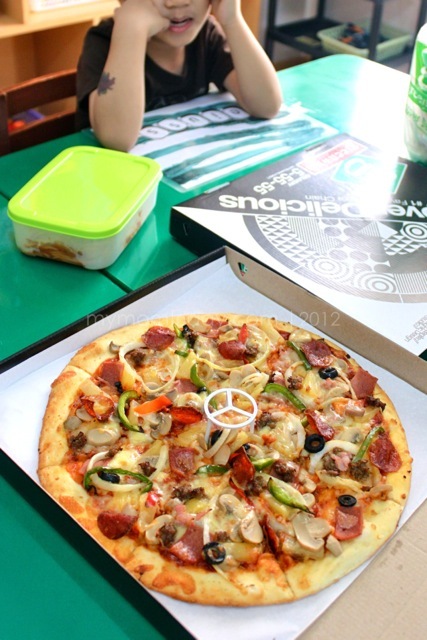 Teachers were also served the same snacks. The pasta was portioned in reusable plastic food keepers - with pink covers for the girls, and blue or green for the boys. These doubled as a practical giveaway. I did not prepare loot bags anymore. They got to take home cupcakes. This was the first time we ordered rainbow cupcakes from Cat (Tazzy Cakes), which were a hit, thus making another appearance this year. 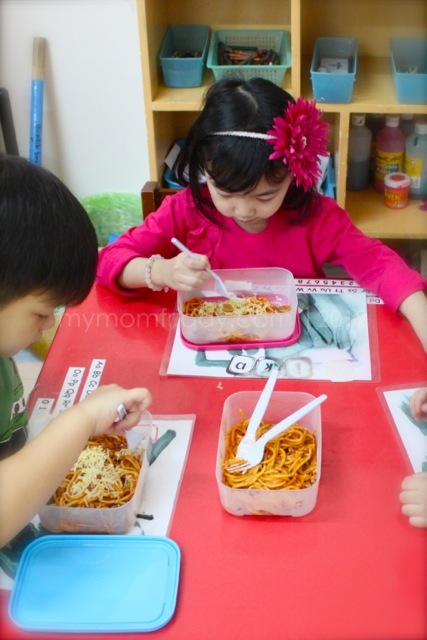 This was the most fuss-free preparation since everything was delivered to school. I just brought the cake. I don't think I gave out loot bags then, but I know each classmate had the Happy Meal which included the Sanrio stamps I featured here. We ordered a basic rectangular birthday cake with rainbow icing. 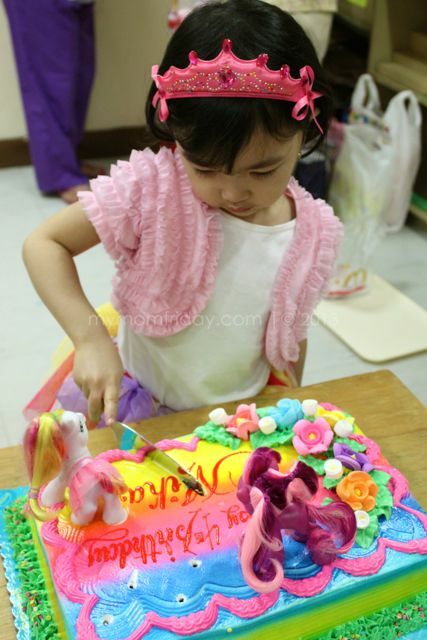 Since our theme that year was My Little Ponies, we used her toy ponies as cake toppers. Again, no over-the-top cakes here. By this time, you may have noticed the recurring rainbow theme. She loves anything "rainbow". 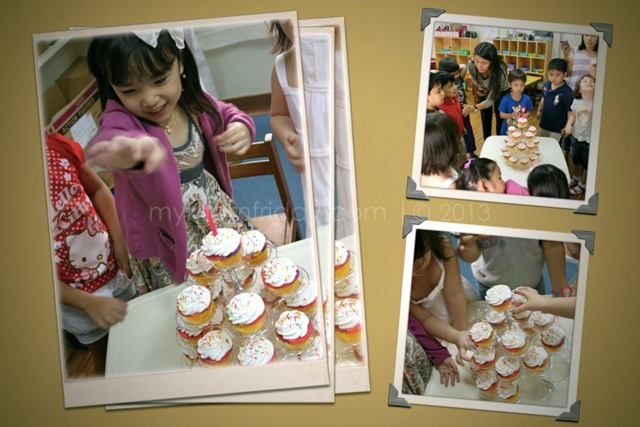 It all started three years ago, the same year she first went to school and celebrated here birthday with the class. Then, and now. 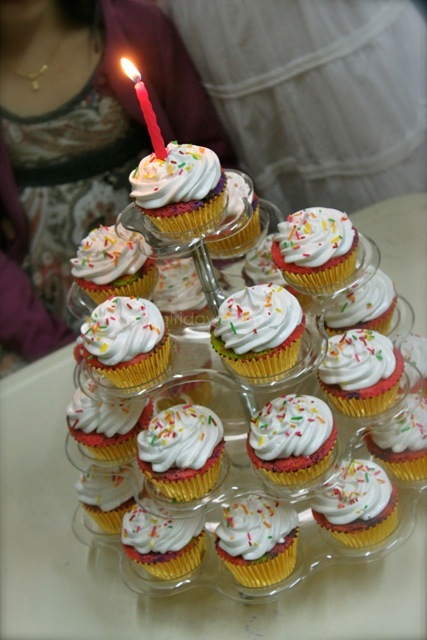 I used the same cupcake tree for serving both my kids' birthday cupcakes in their school celebrations - here's when the boy turned 6. My boy's 8th birthday had a Mario Brothers theme and we gave individually wrapped chocolate cookies (also ordered from Cat, who made the rainbow cupcakes) for his classmates. His was a much simpler celebration of just pizza and drinks. At the girl's most recent class party, I ordered pink and blue chevron-print paper bags from Paper Chic Studio to carry the goodies. The bag was too small to include the pencil, so I just folded the top and rolled over the pencil before sealing each one with a label sticker. 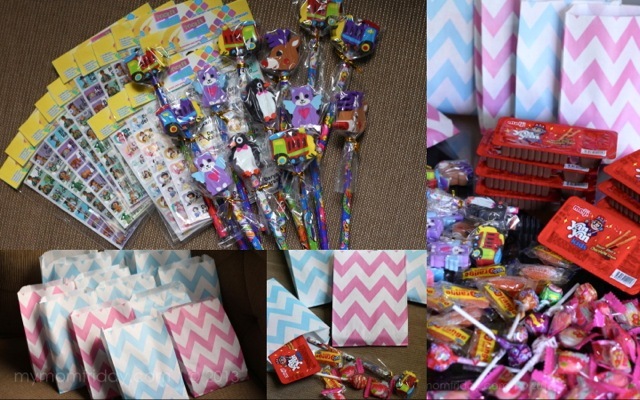 I printed all her classmates' names to personalize the loot bags. 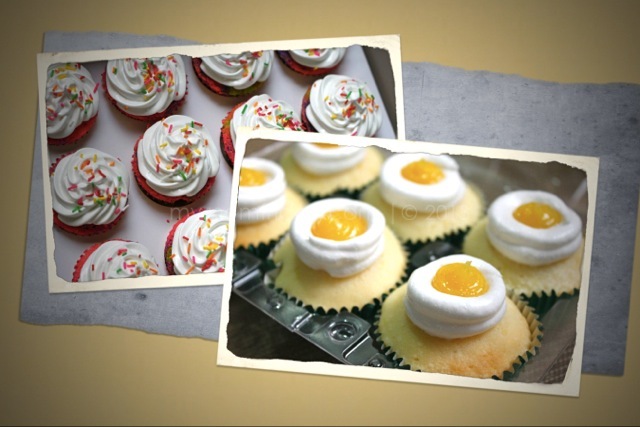 As per M's request, the lemon cupcakes from Bellefleur were for her teachers, and each one was boxed and labeled. 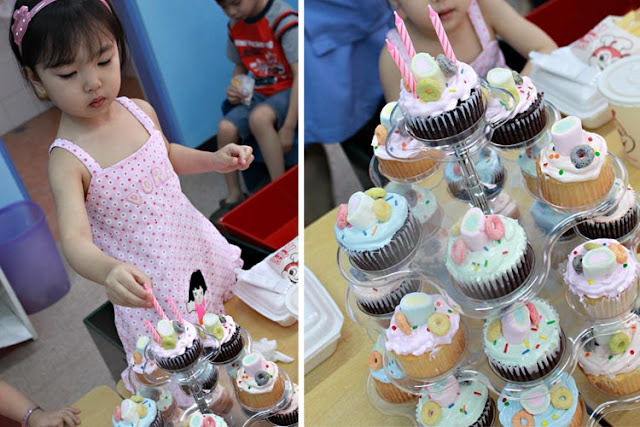 There are so many cute ideas you can do for your child's school birthday party but I still believe in keeping things simple. I realized it's usually us parents who make things complicated with over-the-top elements at times. The kids don't really care what you prepare as long as the have their all-time favorite meals, sing Happy Birthday, and blow out the candle!